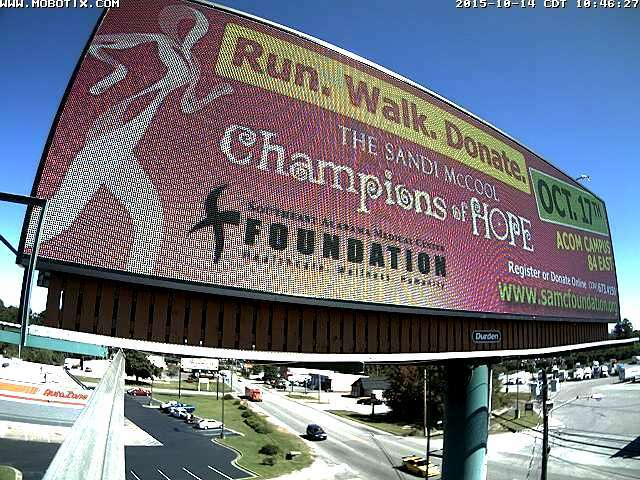 Durden Outdoor Displays, Inc. is excited to partner with Southeast Alabama Medical Center Foundation again this year for the annual Sandi McCool Champions of Hope event. Several Digital Billboards were placed strategically around the entire Wiregrass area to promote this wonderful cause. This year’s event will be held on Saturday, October 17th at the Alabama College of Osteopathic Medicine – Dothan Campus. Champions of Hope honors all breast cancer survivors and pre-vivors. Each year sponsors, runners, walkers, survivors and their families and friends gather to raise money and awareness about the importance of early detection and intervention. http://www.durdenoutdoor.com/wp-content/uploads/2016/06/DUR-Footer-Logo.png 0 0 Amy Riddle http://www.durdenoutdoor.com/wp-content/uploads/2016/06/DUR-Footer-Logo.png Amy Riddle2015-10-14 16:48:252015-10-14 16:48:25Run. Walk. Donate.